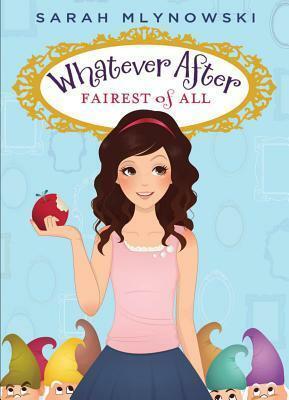 A fresh, modern spin on a classic fairy tale--from bestselling author Sarah Mlynowski! Mirror, mirror, on the basement wall . . .
Once upon a time my brother and I were normal kids. The next minute? The mirror in our basement slurped us up and magically transported us inside Snow White's fairy tale. But hey -- we're heroes! We stopped Snow White from eating the poisoned apple. Hooray! Or not. If Snow White doesn't die, she won't get to meet her prince. And then she won't get her happy ending. Oops. And then, fingers crossed, find our way home. Ha that's pretty funny, and a little OCD lol. Great teaser, thanks for stopping by! This one sounds like a great "retelling" of the fairytale. I like that part about changing things up and then the story doesn't have that happy ending. Thanks for sharing...and for visiting my blog. Enjoy! Love it! I'm gonna have to check out the Mother/Daughter Book Club. I just read one of Sarah's books recently. I may have to check this one out. Thanks for sharing! That could get old. This sounds like a fun story. LOL @ your tease. pretty funny! ouch! :D I just did something quite similar with my mom this evening - reminding her to send a loooong overdue email! Ha! That's a funny teaser. I love that cover btw! Thanks for stopping by My Teaser Tuesdays post featuring Shadow of Night. lol, great teaser. I hope your enjoying this. Awesome teaser! That book sounds like a lot of fun. Thanks for stopping by our blog. Nice teaser. The premise of this book is interesting as well. okkaaay, that watch would be confiscated for awhile lol. nice teaser. Sounds like a great book for my daughter to read in a few years! Very cute teaser. I loved Snow White when I was a kid -- this version sounds really funny. I love the cute cover! And the main character sounds witty. Maybe a little annoying as well. Hope you'll enjoy the rest of the book!